Welcome to the Friends of Clans of Ireland. This is your opportunity to assist Clans of Ireland to achieve its goals by contributing as an individual to the work and mission of Clans of Ireland. Currently our income is very restricted, mainly confined to Clan Registration Fees. This limits what we should be achieving. Our aim is to be an effective lobby on issues that Clans of Ireland should be involved in, mainly heritage issues pertaining to Irish families, but also on a broader platform e.g. the teaching of history at all levels. Our initial goal is to obtain office space and a part-time staff member who would be available to meet people who call to the office, answer queries about Clans and generally help with administration issues. The Board feel that this is the minimum requirements to allow us to represent the interests of Clans registered with us collectively, and to allow us to lobby on heritage issues. 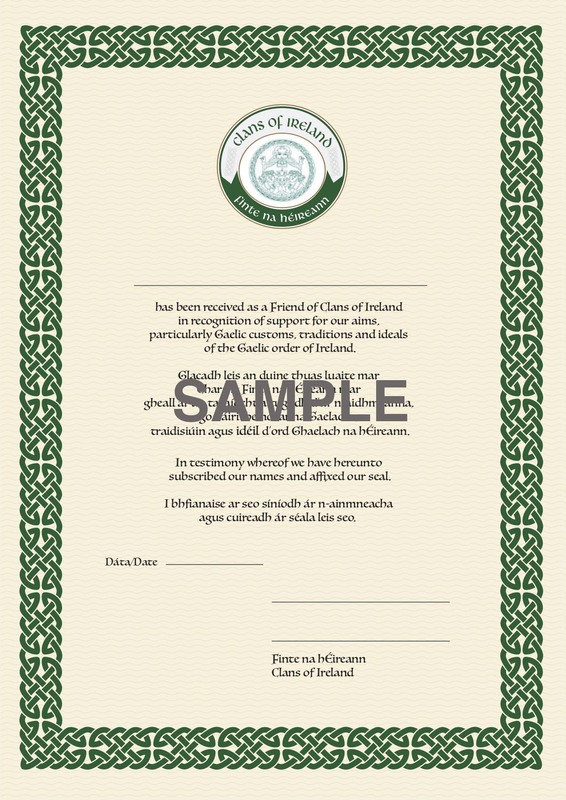 In return for your support, Clans of Ireland will issue you with a quality certificate, suitable for framing, with your chosen name inscribed and proclaiming you to be a ‘Friend’. To make this happen a direct debit of €60 a year would be required, or, you could become a ‘Benefactor’ for a once-off contribution of €500 or its equivalent and your Certificate would proclaim you to be a ‘Benefactor’. The names of all Benefactors will be displayed on our website for ten years. All Certificates are wax sealed and signed by two Board members. 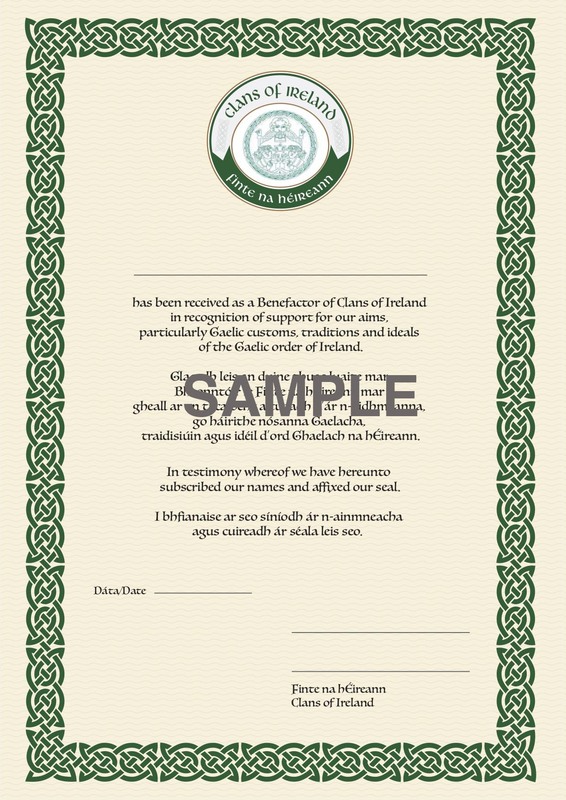 Should you wish to become involved email us on post@clansofireland.ie with your name (as you would wish to see it inscribed) and postal address and forward your subscription by Paypal or cheque to Sentinel Vaults, Waterloo Exchange, Waterloo Road, Ballsbridge, Dublin 4, DO4 E5W7. Please ensure to quote your name on all Paypal transactions. 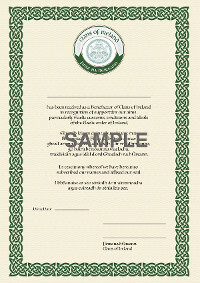 Your Certificate will then be posted out to you. Should you wish make payment by direct bank transfer, please contact us and we will forward you the relevant bank details.